Prices listed in the guide have doubled and in some cases tripled for food, guide fees, and admission tickets. The cheapest lodging you can find in the countryside is now $5 but nice rooms with hot showers can be had for only $12 because of increased availability especially near the new bus stations. The visa ordered online as listed in the guidebook nows costs $140 for the consulate and $99 for the service. But the good news is that the visa is now for ten years, so if you travel to China again within ten years, you can use the same visa. They are building a narrow paved road in many places right over the old road along the stretch covered on the second day of this hike. It's still a beautiful hike and the smooth surface means you don't always have to be looking down to watch where you are stepping, but, nevertheless, another major step toward the complete destruction of the few remaining ancient roads. The guide for Hike 15, Zhai Tianxing, now takes in lodgers for ¥20 a day including meals (which are mostly varieties of noodles for breakfast, lunch, and dinner.) I took the night train from Chengdu to Fengzhou which arrived about 7 a.m. If you don't care about seeing the scenery en route, this is a very convenient way to take this hike. Things are changing so fast in China that it is almost impossible to keep up. In the large cities like Chengdu and Xi'an, entire blocks of old shops and restaurants have been replaced by new high-rise buildings and many of the smaller towns have changed dramatically as well. Below are some of the most recent changes with links to more details and photos. A bullet train between Xi'an and Chengdu is scheduled to be completed by the end of 2016. It will make the trip in three hours. Traffic Hotel: Still in business but the dorm rooms are in the Traffic Inn out back. Langzhong: New memorial arches, a viewing tower, and a section of city wall and new gate have been added to the old town without really ruining it, but replacing the old irregular flagstone in the alleys with new-cut stone slabs detracts from the authentic ambiance. Jianmenguan: At last a town that has actually been improved by change. Jianmenguan was an ugly town when I first saw it 1999 and got even worse when they started building new apartment buildings. Because it was damaged in the earthquake, it received a lot of government money, and private investment soon followed. In 2008 the tunnel being built through the mountain to divert the highway away from Sword Gate Pass has been completed, and instead of a heavily traveled highway through the pass, there is a flagstone pedestrian path. Even better, the flagstone path continues south through the town as well. So the main street has essentially been converted into a pedestrian walkway and the ugly buildings to either side faced with pretty fake facades. Hotel A is gone and you'll have to ask around to find the restaurants and hotels listed as they have all been moved. Follow the link below for photos. Zhaohua: Whereas Jianmenguan was improved by change, Zhaohua was ruined by it, although at this point they both look almost identical. The difference is that Zhaohua was just a few years ago an authentic gem of an old town as described in my guidebook. Instead of demolishing the few intrusive new buildings and refurbishing the many old ones still standing, they put new fake facades over everything, added a huge new parking lot, and turned a sleepy, but authentically old town with its original stone streets (now so improved you can't tell what is new and what is old) into a major tourist attraction with every store selling Zhang Fei beef. Guangyuan: Guangyuan was also damaged in the earthquake and they have made major improvements in their two biggest tourist attractions: the plank road at Mingyue Gorge and the 1000 Buddha Cliff. The highway has been diverted away from both of these attractions. In the case of the 1000 Buddha Cliff where the highway ran right next to it, this has resulted in an amazing transformation. In the process of digging out the highway, an intact stretch of the old stone road was found beneath it which will now be preserved by covering it with glass, so I am told. I find it ironic that this one stretch is being so revered while other equally intact stretches elsewhere are being ripped out to make new roads. This site is still in progress, but it is scheduled to be finished by the summer of 2011. The plank road site has been completed. The plank road itself is much longer, views of the gorge are more spectacular, and since the highway has been diverted, the Tiger's Mouth above the plank road has been added to the plank road site and you can drive through it on a tourist open bus. The site was good before and it is now even better. Follow the link below for photos. were accurate in 2008 but may not be so today. Specific 2008 updates listed below for Chengdu, Jianmenguan, Zhaohua, Guangyuan, Hanzhong, Hike 14, Xi'an, Jiangkou, Ningshan, and Shiquan. The biggest change is there are no pedicabs near Hotel D for a quick run to the mall. Everyone I asked said there are still pedicabs in Chengdu in other areas, but I did not see any in other parts of town either. If they really are gone, Chengdu has lost one of its nicest features. The phone numbers I gave for all the hotel listings in the guidebook were those listed on their business cards and those in Chengdu begin with (86-28). I have since learned that 0086 is the number you dial if you are outside China and 028 is the number you dial if you are outside of Chengdu. Once in the city, the final eight digits are all that you need to use. X. has moved. Even though the building was brand-new, it has already been ripped down to make room for an extra row of stores. The restaurant has moved just around the corner, however. Beginning where X is marked on the map, head into the mall, turn right on the first side street and walk about a block and you will see it on the left with its name written on bright red squares. The �18 snack is now �28 and the �28 snack is �38. Jianmenguan has been officially designated as a gucheng, old town, and the local government, in anticipation of an increase in Chinese tourists, has been making a lot of improvements. The highway between Puan and Jianmenguan has been repaved, an exit off the expressway now goes directly to Jianmenguan, and a tunnel is currently under construction that will detour traffic away from Sword Gate Pass. In addition, many of the new concrete houses lining the highway into Jianmenguan have been spruced up by the government free of charge by painting them white with brown trim which looks like half-timbering at a distance. This means, of course, that prices will be rising. Hotel A will be changing its name to Sanguowenhua Jiudian (Chinese characters to the right) and replacing its dorm building with a very up-scale hotel. The staff told me that a new rule has been instituted saying all new local hotels can only have double rooms so dorm rooms are going to disappear here and possibly in other tourist areas as well. Hotel B �20 doubles without bath now cost �50. There is now a wonderful new alternative to replace the dorm room for cheap lodgings which has come into existence to serve the Chinese tourist traveling on a budget. They are called Nong Jia Le (Chinese characters to the right), meaning Enjoying Farmhouses. Farmers open up their houses to tourists who pay a very modest �30 for one night�s lodgings plus breakfast and dinner with the family. For photos of the one recommended by my guide and owned by Yong Desheng (phone 135-471-73206), click on the link below. It sleeps 12 people in three rooms. Some of the beds have soft mattresses, others just woven mats. My guide can help you find this place, or one of the many others, but if you want to find it on your own, head north on the highway, passing the fort, the chairlift, and the northern exit of the new tunnel. At the first bend to the left of the highway, take the dirt road heading off to the right down the hill. The farmhouse is within a quarter of a mile along this road. The neglected flagstone road in the beginning of this hike has been repaired to lead to a second parking lot for the Green Cloud Corridor. You head to the northeast corner of the old parking lot, as before, but now you will see the rebuilt flagstone path that will carry you down the hill through the old cypress trees and you can ignore all my directions for finding what was once a very overgrown path. Pick up the directions for the rest of the hike at the bottom of page 395 beginning: �Once you join the highway, turn right headed toward Jianmenguan down the hill.� Note after the recent repair and widening of the highway the kilometer markers are now all slightly different so ignore any reference to them in the guidebook. The houses at Wulipo have all been repainted white. The highway heads downhill just after leaving Wulipo at the 1944 marker. If you have passed this marker, you have gone too far. For some 2008 photos, click on the link below. Zhaohua has changed beyond all recognition. It is in the process of being �restored� as a major tourist attraction. The ugly modern buildings, happily, are either being ripped down entirely or concealed by a new fa�ade. The sad thing is that some of the original wooden buildings that were still standing have been ripped down as it would have been too expensive to restore them. The three Qing dynasty houses are still standing, though, although one has been given a new facade. Money is being spent on constructing new things, some of which once existed. These include two stone memorial arches, wooden gate houses on top of the three original gates, and a new stone wall encircling the city (the original wall I am guessing was a more modest dirt one.) I would have preferred it if they had simply forbidden the building of the new ugly structures and just left the original town alone as the sleepy outpost it once was. Now it is going to be mobbed with tourists and there will be an admission fee to get in once the project is finished. Already an unsightly new parking lot has been built just northeast of the town. If you travel there by bus from Baolun, the bus will let you off in the new parking lot which is at the eastern end of Taishou Street outside the east gate. Head for the new stone memorial arch and follow Taishou Road through it west into town. Hotel A is still there hidden behind a fancy new wooden fa�ade. It has a new name, but I can't make out the characters and although the landlady wrote the name down for me, I couldn't read her writing either. But show the actual characters to the right to a local and they will know where it is. Inside the new facade, the hotel itself has remained basically the same. The one improvement is that the squat toilet has been moved from the backyard to the second floor where the rooms are. The higher prices refect the improvements to the town rather than an increase in comfort at the hotel. Basic doubles without bath now cost �60 and dorm beds �30. There is one double with bath for �80. There is also still a nice restaurant on the premises. I am sure some upscale hotels will soon be built for the new tourist trade. Hotel B (and Qing dynasty house 3b) is no longer a hotel or restaurant and now charges admission to get inside. Hotel C is either concealed by a new fa�ade or no longer there. The Qing dynasty house, 3a., still has several families living inside and does not charge admission as yet anyway. You can just walk in and look around as the courtyard sections of the house are considered public rather than private property. There is a very nice new hotel right next to Bus Station B1 called the Lijingshangwu Binguan. It has doubles with bath for �96. The cheapest double with bath is �100. C. Cheapest double with bath is now �150. D & E. Cheapest room without bath is �50. V & Y are gone. No longer at the railroad station. It is now just south of the railroad station on the left side of Renmin Road as you are heading south just before you reach Tianhan Road. There is now a bus from Hanzhong that runs straight to Xiaoba. This means you no longer have to stop at Moujiaba and switch to a van. The bus does not leave from the Hanzhong Bus Station (B1), however. You must catch a cab south along along the N-S road by the bus station to Dahekan, which is south of the city just over the bridge that crosses the Han River. Show the cab driver the name of the bus (click on the Hike 14 link below to see the Chinese characters) and he will know where to drop you off. There is only one bus a day leaving Dahekan at 1:30 p.m. If for some reason you don't take the hike and have to return to Hanzhong, there is one bus a day leaving Xiaoba at 7:30 a.m. Even though Li Ming does not drive the van anymore, you can still stay at his house in the village of Xiaoba. Dinner, sleeping, and breakfast cost �30 per person. You can also sleep in Dai Shaolun�s farmhouse which is about a ten-minute walk out of town. Sleeping over and two meals at his house cost �30 per person. Beds at both locations now have mattresses. Dai Shaolun now has a cell phone (1389-268-1028) so you can call him directly to arrange the hike. His price per day has risen to �50 and if you want someone to carry your backpack it will cost � 40 per day. After the hike is completed, pay Dai �150 for bus fare and expenses to return home. In addition, don�t wait until the end of the two-day hike to pay him his daily salary. Pay it at the end of each day. For photos of Dai's farmhouse and characters for the Dahekan bus stop, click on the link below. Hotel E. I mentioned that the manager, Jim Beam, would soon be opening a new hotel and it is now up and running. Located just down the street from Hotel F near the south gate it is called Xiangzimen Guoji Qingnian Lushe. Phone: (029) 6286-7888. The front door is at 16 Xiangzi Temple Street and its back door opens onto the alley that runs by the city wall. It has been designed to resemble a traditional courtyard house and succeeds quite well. There are two elegant doubles with bath that face the courtyard for �180 and cheaper doubles with bath in the main building. Beds in a dorm go for �50. Jim Beam spends most of his time here now and is as helpful as ever. The staff is friendly as well. Music in the bar plays until late at night so if you go to bed early, chose a room near the front of the building. Hotel A is still there. Doubles with bath are now �60, but this is not a drop in price. My guidebook says �80 because he overcharged me the first time, according to my guide. This is still the best place for cheap rooms, but there are two nicer hotels on the side street leading to my guide�s house. See Chinese characters for these hotels, the Huifeng Jiudian and the Guiqiang Anzhan, to the right. Hotel C has upgraded and changed its name to Jingshi Binguan. Dorm beds have gone up to �30 a night and rooms with bath have been added for �70 per night. Restaurant Y (Snack City) is no longer there and this former food stall area is now occupied by a raised terrace. Restaurant W is also gone, but a self-serve hot pot restaurant called Tianfu Huoguocheng has opened nearby. Hotel B next to the bus station is gone. Take a three-wheel taxi instead to the Youzheng Binguan which has doubles with bath for �90 and doubles without bath for �50. 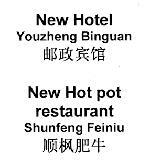 There is a very nice new hot pot restaurant called Shunfeng Feiniu which has individual hot pots for everyone at the table for �3 each and then you pay for whatever ingredients you order. Just show the three-wheel taxi driver the Chinese characters to the right.